A Free ATM Placement is an excellent way for your high traffic locations to create additional revenue while providing the convenience of cash to your customers, all without any hassle whatsoever. 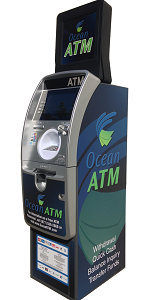 Ocean ATM will provide an EMV ready ATM, transaction processing, maintenance, signage, cash replenishment, insurance, supplies, and any dispute resolution. We do it all, and send you a monthly commission check. Contact us today through the form below or call us now at (732) 899-9009 to see if you qualify and order your ATM(s).